Anina credits her skill with words to a combination of genetics and her lifelong interest in reading. As a young girl, she avidly devoured works by authors as diverse as Shakespeare, Toni Morrison, and Robert Heinlein, while enjoying the sparkling banter of classic screwball comedies (His Girl Friday) and BBC costume dramas (I, Claudius). Among the infuences on Anina’s work are her favorite writer, Ursula K. Le Guin, and favorite director, Billy Wilder. Anina is the co-creator of BigRedHair.com and the writer/editor/designer of the Heartbreakers Superdigest series of science fiction graphic novels. Her first Heartbreakers story, created with husband Paul Guinan, was published in 1989 in the anthology series Dark Horse Presents. Since 1989, Anina has written a Heartbreakers miniseries, Heartbreakers Bust Out! collection, Heartbreakers Superdigest, Heartbreakers Superdigest: Year Ten, and Heartbreakers Meet Boilerplate. As a project editor, Anina has worked for First Publishing (the company that successfully revived Classics Illustrated), Dark Horse (producers of The Mask), and the transnational Egmont Publishing. She managed scores of titles, including Classic Star Wars, Nexus, Harlan Ellison’s Dream Corridor, Grimjack, Cud Comics, The Blue Witch of Oz, and Mickey Mouse and Donald stories for Euro-comics. She is a founding board member of the nonprofit organization Friends of Lulu and helped launch the national magazine Too Much Coffee Man in 2000. Anina co-authored The Big Book of Bad, The Art of Comic-Book Inking, and DHP: Aliens. 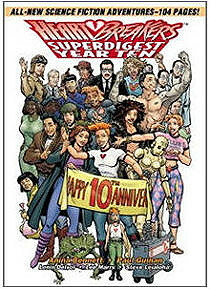 Her third, all-new Superdigest was published in July 2005 by IDW. 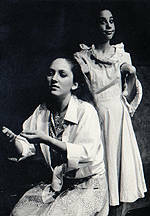 At left: Anina was photographed for a famous Chicago hair salon's advertisement in the late 1980s. She had been growing her 'do out from a mohawk. While still in Chicago, Anina did editorial work for the Sierra Club's regional chapter and The Chicago Lawyer newspaper. Since moving to Portland in 1991, Anina has written and edited for Northwest Parent Publishing, Interactive Composition Corp., Adhesive Press, Dark Horse Comics, and others. She’s conducted workshops on writing and drawing for kids, young adults, and even law students, including the first-ever comics writing workshop at the 2004 Willamette Writers conference. Anina currently works as the marketing writer and proposal administrator at Stoel Rives, one of the West Coast’s largest and oldest law firms. Anina is an occasional entertainersometimes even on purpose. Her performing history goes back to high-school productions, in which she acted alongside future Hollywood stars!